Great architecture feeds a great lifestyle. 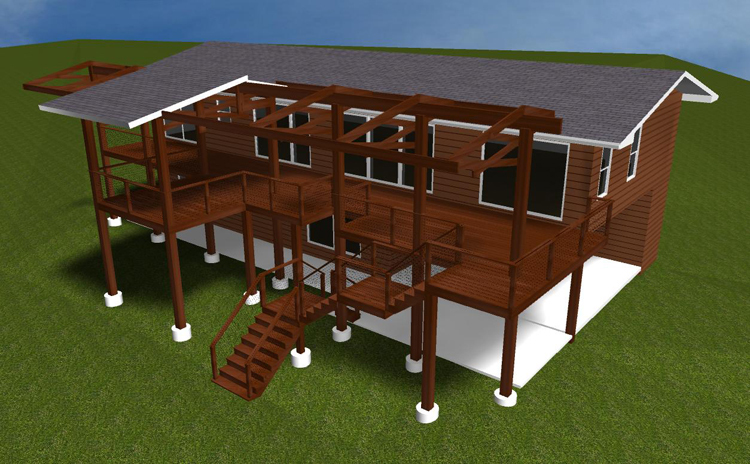 Here is the design rendering for this beautiful deck by Archadeck of Austin from another angle. We always welcome the opportunity to be able to work hand in hand with a skilled architect. We welcome the opportunity to work with customers whose architect developed a plan for their outdoor living space. However, often, the homeowner will bring in the landscaping plan which was drawn up by their landscape architect and based on this Archadeck of Austin incorporates an outdoor living space to fit in with their landscaping. The dilemma with this is that it is best to design the outdoor structure first and then customize the landscaping to fit in with the structure’s style and dimensions as well as that of the existing home. In the case of this homeowner, they came to us while they were still in process with another contractor that had left them frustrated because of the number of mistakes they were seeing. These homeowners brought their architect’s design to the table along with the confidence that we could turn this project into something they could be proud of. This photo shows the vision from the original architects drawing. 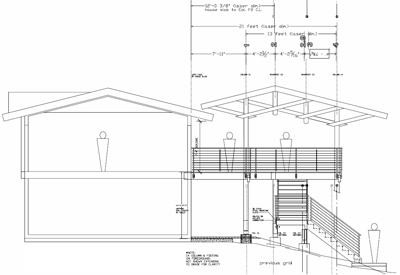 When we received their architect’s design, we put it through our standards and structural warranty design process that Archadeck of Austin does with all it’s plans and also drew a set of plans that fit our criteria for loading and other structural aspects. The structure Archadeck of Austin is building for these homeowners is a 1,000 square foot Tigerwood deck. It will have a roof over the dining area portion which is right off the homes master bedroom. The deck will also have a cooking area on the other end. There is a split level staircase. There will be a roof structure that will be over the dining area and a shade structure over the entire remainder of the deck. The shade structure is quite unique in that it uses a truss system of framing in order to maintain the size of the structure using minimal posts. The most unique feature of this deck is that when most people build a deck, you don’t want to see any framing that is visible, on this deck the details of the framing will be one of the main focal points of the structure. We are using large 8 x 8 beams, opposed to the usual 6 x 6 that are commonly used. The beams are made of Douglas Fir and all the framing is oversized to take on a personality of its own to accentuate the entire structure. 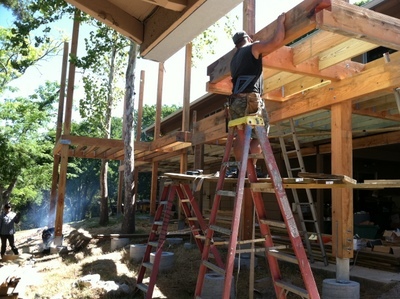 The beams are kept from actually touching the ground by the addition of custom-made steel. The structure will use a bullwire railing system to maximize the view. 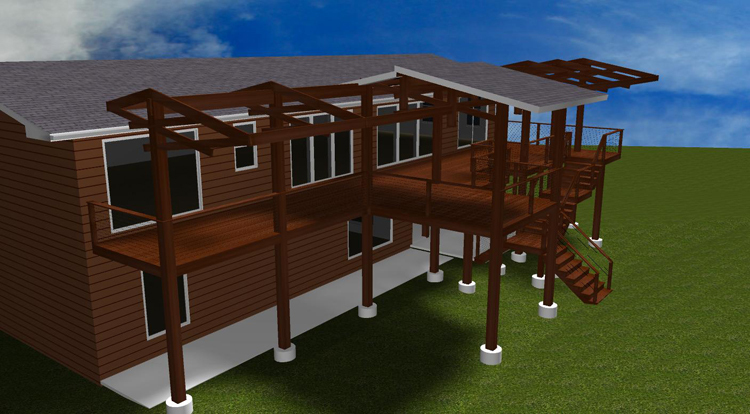 The deck will have a beautiful non-obtrusive view of a canyon. Archadeck of Austin is busy at work making this dream a reality for these Austin homeowners. The homeowners’ desire is for an architectural look that also has the characteristics of age-old craftsmanship. In most cases a structure can either possess architectural quality or functional quality, this structure will have both.The beauty of the framing system in itself, alone is worth talking about. Great architecture like this feeds great living. When you have a home that is well designed and well-built by an experienced builder, you live well in it. Where there are focal details and striking architectural beauty, it makes you living experience even better. Adversely, the same is true. When you have a detail that you just aren’t happy with, these small elements can detract from your living experience. This is why it is so crucial to start with great architecture and design, it can make a world of difference in the way you think, feel and live day-to-day. Another angle from the design rendering shows attention to every detail. This entry was posted on August 24, 2011 by austinporchandpatio. It was filed under Austin decks, Customer service, Decks, Materials, Tigerwood, Tigerwood decks, Working with architects plans and was tagged with 2-story decks, Archadeck of Austin, Austin deck builder, Austin decks, Austin outdoor room, Austin shade structures, Austin tiger wood decks, Austin tigerwood decks, decks Austin, Project planning, Tiger Wood decks Austin, tigerwood decks austin.